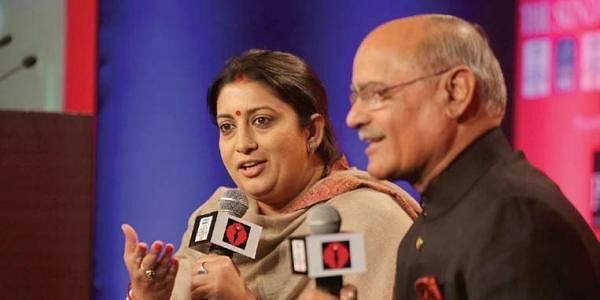 Union Minister for Textiles, Smriti Z Irani is known for her well-rounded debates, both inside Parliament and outside it. At the third edition of The Sunday Standard Devi Awards in Delhi on Friday, Irani was her usual witty self, taking on questions from Prabhu Chawla, Editorial Director of the New Indian Express Group. Excerpts. From an actor to an able administrator. How has the journey been? I have had my battles and I'm proud of the fact that I am a part of the administration. I believe every woman is engaged in some kind of close quarter battle, every single day. The problem lies in the fact that the battle is against our own people, and not strangers. But I am confident that whatever may be the challenges, we will succeed. Whom do you consider a Devi? To begin with, I am talking as a woman and not as a minister. I celebrate every woman who is fighting a battle but not getting any award for it. Those who keep their families together and yet are able to keep their dreams alive are true Devis. Margaret Thatcher once said that a woman who understands the challenges of running a house is very close to understanding the challenges of running a business or an administration. How can women make Indian brands more famous? Women are already doing that. Let's talk about textile as an economic sector, where over 70 per cent workers are women. The richness of our handcrafted legacy cannot be measured in terms of what it is worth in an international arena. I am launching e-dhaga, a mobile app in three languages that will bring details of yarn supplies directly to the weavers. Also, weavers are often unable to buy new looms owing to a shortage of funds. We have started an initiative where the government, for the first time, will bear 90 per cent of the cost of the loom. As textile minister, I not only have challenges to overcome, but also the opportunity to set a lot of historical wrongs right. You have handled two portfolios now. How different are the two? I never try to prove anything to anybody. In both roles, I have tried to do my job well. When you are trying to prove something, it is a disservice to the responsibility bestowed on you. I remember walking into an IIT Council meeting and asking why it didn't have a single woman on the panel. No one had an answer. I inducted two women. As a woman, what broke my heart was the surprise in scientist Tessy Thomas' voice when I told her that I wanted her to accept the position in the Council. This needs to change. Why are women not trusted with important posts? That's not true. Three of the most important portfolios in the government are headed by women. External Affairs, Commerce and Textiles are all economically-driven, important portfolios.